Located on 14 Mile Rd., about 1-1/2 miles West of Hwy 131, Leroy exit. Nice mix of woods and open. Pine on the west, hardwoods in northeast. High and dry. No marsh or wetlands. Measures 665 feet square, with a leg running north to the County Road. It will make an ideal building site, and is also suitable for a mobile home, and for camping and hunting. Note: Currently the A2 sign is not up on this property. Be sure to print a copy of the Plat and bring it with you, to help you find it. The A3 sign is still up, which will help you know you're in the right place. Bright orange stakes are set on all the corners as shown on the plat to make it easy for you. I used to live within a few miles of this property. I've traveled all over Michigan, but this is my favorite part of the State. Land in this area is hilly and beautiful. The hunting is great, and there are lakes and streams everywhere. The larger tract from which this parcel is split, is at the intersection of 14 Mile and Woodpecker Trail. 14 Mile is paved is paved; Woodpecker Trail is a private road which grants access to the service road running parallel with 14 Mile, but not any further south. 14 Mile is maintained by Osceola County, and plowed in the winter. Some of the tracts are located on private easement. See the Plat for more details about this particular parcel. Electric lines run all the way down 14 Mile Road, and also for a ways down Woodpecker Trail. It also runs about halfway down the West easement access toward A5. So it looks to me like the only parcel for which electricity might be difficult is A4. That's not to say you can't get it, just that it's farther to run. The easement to A4 includes utility, so it's always an option if you want it. For water and sewage-- hey, you're out in the countryside. If you want these, you'll have to put in your own well and septic. All this land is high and dry with sandy/loamy soil. You'll have no problem with drainage, and can put a septic tank and drain field anywhere you like. Any one of these parcels are very good hunting, and full of game. While I was marking the corners, I saw a bunch of deer. I didn't see turkeys, but I did see signs they'd been around. Choose your parcel according to the kind of hunting you most want to do. The wooded parcels are where the big bucks hide, and if you're a bow hunter that's where you'll want to be. If you're a rifle hunter, it's enough to know the bucks are in those woods, and you'll get a shot when they come out to rut. Choose something a little more open, so you'll have a good shot. Restaurants / Bars. Restaurants in Tustin, Leroy and Luther. One bar in Leroy, and two in Luther. Twin Creeks Inn is also a good choice - they make an excellent wet-burrito; wash it down with a beer. I'll let you decide which ones will be your favorites. The Traveler's Bar in Leroy makes excellent pizza, and last week (as I write this) I had some of the most tender potroast I've ever eaten. Mr. PIBBS in Leroy also has great food and friendly service. Howe Lake. Here's an unexpected bonus-- just 2-1/2 miles west of this land is 40-acre Howe Lake. It doesn't have sandy beaches, but it does have a public boat launch. Looks like a father and son were out fishing the day I was there. Canoeing. About five miles north on Raymond Rd., is a public access to the Pine River. From there the river flows northwesterly for a looong way. One mile north, and two miles west, there's a bridge with a spot where it's easy to retrieve a canoe. Do yourself a favor and look at this setting on Google Maps. The distance between the public-access and the bridge as the crow flies, is 2-1/3 miles, and to drive it is less than three. The river winds around so much that to stretch it out it's probably seven miles. When I lived in this area I used to canoe this stretch all the time. Of course you'll want your own canoe, have a friend, and two cars, so you'll have a car waiting at the bridge. This is as quick and easy as canoeing can possibly get, and it's one of the most beautiful spots you'll ever float. Trails. Six miles to the east, you'll find a block of more than 10,000 acres of State Forest, with trails all over it, on which you can ride trail bikes, four wheelers, and snowmobiles. Just one mile to west, you enter into Lake County, which has a higher proportion of public lands, both State and National Forest, of any other County in Michigan. 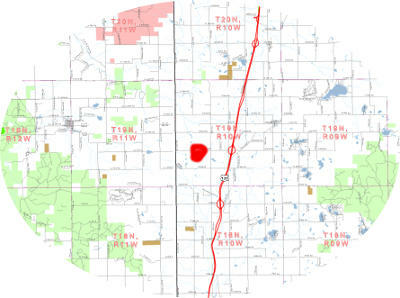 Just look at this map showing public lands-- green is State Forest and red is National Forest (the red dot in the middle shows where this land is located). You can follow trails on these public lands right up into Wexford County, and all the way to Cadillac. If you like to ride trail bikes, four wheelers, and snowmobiles, you have found paradise. Get on your snowmobile, and ride all the way to the Cadillac Sands Resort, where you can have a hot toddy of your choice before you turn around and ride back. By the way, you can download a high quality map of public lands in Lake, Osceola, and Wexford counties, here. Lakes. You're less than ten minutes from the public access on Diamond Lake. If you're looking for an all-sports lake with a really nice public access, the County Park at Rose Lake is only about 10 miles away. Rose Lake is a jewel of the North. A natural lake, 373 acres in size; spring fed, the water is clear and the fishing is great. Rose Lake is an all-sports lake; there's a boat launch at the County Park. That means you can fish, swim, water-ski, pull a tube behind your boat, or just put-put around in a pontoon and grill steaks (that's what I like to do). You're also within a half-hour of Lake Cadillac and Lake Mitchell. Subject to an easement over the Tracts #2 and #3 for the purpose of ingress, egress and utility, for the benefit of other parcels in the northwest quarter. Land Contract (Standard): $3,090.00 down, $358.24 per month, for 15 years. Payment includes property taxes. Interest rate is 11% simple interest; no penalty for early payoff. 90 days same as cash. That means you can buy on land contract, and if you pay off the full balance within 90 days, you pay zero interest. Land Contract (Low Down Payment): $1,545.00 down, $494.78 per month for the first year, after which time your monthly payment drops to $358.24. Payments include property taxes. Interest rate is 11% simple interest; no penalty for early payoff. Term is 15 years; 90 days same as cash.